Carsharing is a model of car rental where people rent cars for short periods of time, often by the hour. They are attractive to customers who make only occasional use of a vehicle, as well as others who would like occasional access to a vehicle of a different type than they use day-to-day. The organization renting the cars may be a commercial business or the users may be organized as a democratically controlled company, public agency, cooperative, ad hoc grouping. Today there are more than one thousand cities in the world where people can carshare. Car sharing is to automobiles what time-sharing is to resort properties—a group of people that share a resource. Many people do not need a car at all times, and their household’s first or second vehicle may not be used much. Being able to use a car "part-time" may meet their mobility needs at a lower cost to themselves and society. Further, some may need access to a minivan or a pick-up truck at times. Car sharing is a mobility option that might be considered a means to own a fraction of many cars, something that is not possible for most people. Advances in information technology make car sharing possible. The reservation and ―check in‖ process is fully automated, as bookings are made online or via a smartphone and vehicles are accessed using a smartcard. Any unpaid tolls or traffic tickets incurred by the user are generally added to that customer‘s credit card bill. AB 1871 - California law allowing for personal vehicles to be used as part of car sharing programs across the state. The law, which went into effect on Jan. 1, 2011 will let people who are part of car sharing networks hire out their personal vehicles during the time they are not being used–90 percent of the day. The new 2010 law means that people who wish to use their personal vehicles in car sharing programs no longer need to buy livery insurance for taxi cabs. What it also means is that a the owner of a vehicle will not be held personally liable for damage, injury or death that occurs while someone else is driving their car. Car Clubs - UK name for carsharing. Carpooling (Also known as "ride-sharing") - The shared use of a car for a specific journey, in particular for commuting to work, often by people who each have a car but travel together to save costs. However, there is a slight terminological hitch in the UK where the term car sharing (two words in this usage) is used for what in the U.S. is called "ride sharing". Under California law, the definition of ridesharing does not permit transportation performed for profit. Recovery of actual costs incurred only applies to vanpool vehicles, which is defined by the Vehicle Code as seating more than 10 passengers, but less than 15 passengers, including the driver. Dynamic Ridesharing - (also known as Instant Ridesharing, Real-time Ridesharing, Ad-hoc Ridesharing, or Dynamic Carpooling) - A service which enables the formation of carpools on very short notice. Typical for this type of carpooling is arrangement of one-time trips instead of recurrent appointments for commuters, the usage of mobile phones for placing carpooling requests and offers through a data service, automatic and instant matching of rides through a network service, The network service compensates the driver by an integrated billing system. While there exist plenty of carpooling agencies for commuters, there is no large scale operation of an instant ridesharing service today. However, pilot projects have proven the technical feasibility of such service. Free-Floating Carsharing - Allows users to take and leave vehicles at any point within the city limits. Thus opposed to traditional car-sharing, there are no fixed stations and in particular one-way trips of any length are possible without a booking requirement. Under the proposal, the CPUC would have jurisdiction over ride-sharing under a new category of businesses called transportation network companies. The agency would also issue licenses to the services. Regulators would require drivers to undergo criminal background checks, receive driver training, follow a zero-tolerance policy on drugs and alcohol and carry insurance policies with a minimum of $1 million in liability coverage. The decision is expected to preempt efforts by California cities to oversee or even ban ride-sharing under their authority to license taxi cab firms. P2P - Peer to Peer Carsharing - (sometimes called distributed, neighbor-to-neighbor and car sharing 2.0) Enables car owners to make their personal vehicles available for hourly use when they do not need them. P2P carsharing takes advantage of the fact that the average vehicle is idle for long periods of a typical day. Although this innovative strategy can supplement the income of participating vehicle owners, it suffers from several notable drawbacks, such as inconsistent quality of the customer experience as well as legal issues relating to automotive insurance. Slugging (Also known as Casual Carpooling) - The practice of forming ad hoc, informal carpools for purposes of commuting, essentially a variation of ride-share commuting and hitchhiking. While the practice is most common and most publicized in the congested Washington, D.C. area, slugging is also used in San Francisco and other American cities. VMT - Vehicle Miles Traveled - The total number of miles driven by all vehicles within a given time period and geographic area. It is used by regional transportation and environmental agencies for planning purposes. VMT is influenced by factors such as population, age distribution, and the number of vehicles per household. However, the greatest factor by far is how land uses are arranged. A more tangible measure of car use may be per capita VMT, which is the number of miles driven per person per day. For example, residents of an auto-oriented neighborhood in Atlanta (the most sprawling city in America), drive an average of 39 miles per person each weekday, which is 30% more than those who live in the most walkable neighborhood. VMT has increased steadily during the post-war period. However, total U.S. VMT began to plateau in 2004 and dropped in 2007 (and again in 2008) for the first time since 1980, a recessionary year. Car sharing might be considered something like hourly car rental for preapproved customers with cars close to the customers’ homes. Reserving, using, and returning the cars is simple. Insurance, fuel, licensing, maintenance, and car payments are handled by the car share organization, and members pay only for what they use. Vehicles are picked up and dropped-off at unattended locations called ―pods that are generally distributed throughout a service area rather than at a centralized location. Members typically pay annual or monthly fees on top of variable fees based on the number of hours, and sometimes the mileage, associated with each trip. Special ―day rates are available for those seeking to use vehicles for longer periods. The reservation and ―check in process is fully automated, as bookings are made online or via a smartphone and vehicles are accessed using a smartcard. Any unpaid tolls or traffic tickets incurred by the user are generally added to that customer‘s credit card bill. As of January 1, 2011- based on data provided by Transportation Sustainability Research Center (TSRC) at the University of California, Berkeley. 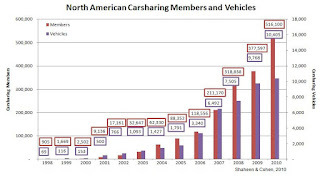 - 27 U.S. carsharing programs claimed 518,520 members sharing 7,776 vehicles; and 85,439 members shared 2,342 vehicles among 17 carsharing organizations in Canada. Survey data collected by Shaheen, Cohen and Roberts suggest that, based on conditions in 2004, carsharing could eventually serve up to 12.5% of the U.S. population over the age of 21. Considering that the market share of carsharing organizations remains almost negligible (about 0.2% of the country‘s urbanized population are presently members) the risk that the business will face saturation anytime soon seems low. Reduced Congestion - Replacing private automobiles with shared ones directly reduces demand for parking spaces. The fact that only a certain number of cars can be in use at any one time may reduce traffic congestion at peak times. Even more important for congestion, the strong metering of costs provides a cost incentive to drive less. With owned automobiles many expenses are sunk costs and thus independent of how much the car is driven (such as original purchase, insurance, registration and some maintenance. Reductions in the number of vehicle miles traveled on streets and roads can reduce demand for additional publicly financed infrastructure. Reduced Car Ownership - This effect is definitively documented in Greenhouse Gas Emission Impacts of Carsharing in North America, by Elliot Martin and Susan Shaheen. This Mineta Transportation Institute study targeted more than 100,000 members of carsharing organizations throughout Canada and the United States, including those of Zipcar. The results paint a compelling portrait of the effects of carsharing. The number of owned vehicles per household falls by nearly 50% when a family member begins carsharing. Only 12% of households that own a vehicle before using carsharing retain the same number of vehicles afterwards, while the remainder eliminate at least one vehicle. 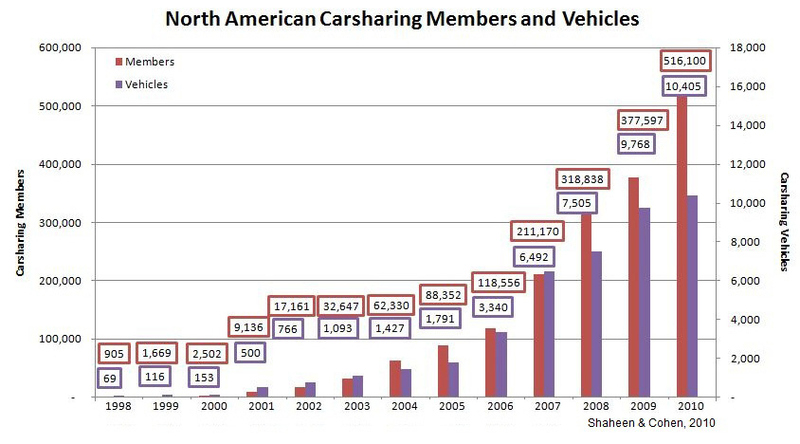 Among carsharing households, the average number of vehicles drops from .55 to .29 vehicles). The study also found that, for each carsharing vehicle added to the system, between 9 and 13 privately-owned vehicles are removed from the road. Such findings allowed the authors to conclude that carsharing on the whole has removed between 90,000 and 130,000 vehicles from the transportation system, either through the elimination of an owned vehicle or by joining carsharing in lieu of purchasing a new vehicle. According to the University of California Transportation Center, car sharing leads to the reduction of personal vehicles owned. The UCTC study surveyed 6,281 households that were part of car sharing networks, and found that households owned 2,968 vehicles before car sharing, or 0.47 vehicles per household. After car sharing, the group owned 1,507 vehicles, or 0.24 vehicles per household, a decent sized reduction. Reduced GHG Emissions - Estimating the effect of carsharing on greenhouse gas emissions (GHG) requires detailed before-and-after data about changing travel behavior, including the mileage traveled via various modes of transportation. The calculations also must consider the make and model of vehicles used. Safety - Fewer cars = fewer crashes. When we each take our own cars to work, we contribute to traffic jams and slightly increase our risk for a collision or mechanical breakdown. Congestion is a leading cause of accidents, and can have a maddening domino effect. All it takes is a single car hitting a guardrail during rush hour. Traffic thickens and becomes more dangerous as the car is cleared and our natural rubbernecking tendency kicks in. Prime time for fender benders. Congestion also leads to road rage, which is another leading cause of avoidable accidents. Some of the most popular and effective carpools take place during commuting hours, and there’s no better time to take a car off the road. Social Equity - Carsharing makes occasional use of a shared vehicle costs significantly less than car ownership making automobile use more accessible to low-income households. User Savings - Carsharing effectively unbundles the fixed cost of owning a car so that members pay a portion of the cost of ownership each time they travel rather than in large lump-sum amounts, such as through a monthly payment. For those driving less than the average number of miles a year, car sharing will be less expensive than owning a car. Members in a car sharing organization will tend to use transit, walking, or bicycling for a significant share of their transportation needs. Car sharing allows the added option of a car to these transportation choices. Studies place the annual savings between $2,057 per year (in the case of Lane‘s study in Philadelphia) and $7,200 per year (in the case of the claim made by Zipcar). Increased Incentives to Economize - Unbundling the fixed and variable costs of operating a car can dramatically alter motorist behavior. Among conventional motorists lease payments, license fees, and insurance coverage do not change in accordance with vehicle mileage traveled. Once these costs are paid, vehicle owners naturally decide whether or not to drive primarily on the basis of the variable costs, such as gas, parking, and tolls. Research shows that carsharers tend to be more nimble in choosing modes based on the characteristics of each trip and more acutely aware of the true costs of driving (Lane 2005, 164-165; Katzev 2003, 81-82). Many naturally increase their use of trip-chaining by combining trips to multiple destinations (Millard-Ball et al. 2005, 4-25; Katzev 2003, 81-82). Health Benefits - Resulting from a more active lifestyle that places greater emphasis on walking and biking. Studies by Price (2006), Millard-Ball (2005), and Scott (2003) found that an appreciable percentage of carsharing users walked, biked, and used public transit. These data do not measure the intensity of the increases or decreases in travel on these modes and thereby cannot be used to measure the changes in mileage. Nevertheless, they support the view that carsharing fosters an increase in active transportation while having little effect on use of public transit. Lower development costs - In The High Cost of Free Parking, Donald Shoup demonstrates that the minimum parking requirements imposed by communities are often excessive and that they can inadvertently increase the costs of development. These associated costs are passed on to consumers in the form of higher prices for purchasers, tenants and customers of residential and commercial spaces (Shoup 2005, 127-164). His research suggests that consumers can benefit from the reduced inefficiency made possible through elimination of poorly utilized parking places. When parking requirements are lowered, developers have the option of increasing the density of other aspects of their projects. Litman argues that such increases in density can, in turn, make other modes of transportation, such as bus service, more practical. One result could be a greater number of dwelling units per acre without added congestion. Unfair Competition with Traditional Taxi Services - The highly regulated taxi industry is howling at the prospect of losing fares to new and typically cheaper competitors. "This is an existential threat," said Mark Gruberg of the United Taxi Cab Workers of San Francisco. "It's hard to see how the taxi industry with its rules and regulations and responsibilities can compete with a service that has none of those requirements." The San Francisco Cab Drivers Association (SFCDA) finds it disturbing that the CPUC is seeking to create a new class of for-hire transportation service (TNC - Transportation Network Company) which would not have the oversight of local regulatory bodies while unfairly competing with existing locally regulated taxi services. They say the CPUC's measure essentially deregulates California’s taxi industry for numerous reasons. The CPUC has only five safety enforcement investigators for all of California, clearly not enough to enforce the new rules they are proposing. They say any additional class of transportation provider, which offers the same on-call/on-demand passenger transportation service as taxicabs without the same regulatory standards, renders existing regulations meaningless. Without proper local regulatory oversight this can only lead to abuse by TNC drivers, companies and the opportunistic element leading to the decreased quality of passenger service for the disabled, elderly and disenfranchised who rely on taxis for transportation. The CPUC reasons that unlike taxi cabs, which may pick up passengers via street hails, PU Code § 5360.5 requires that charter party carriers operate on a prearranged basis. The CPUC found that TNCs operate on a prearranged basis. PU Code § 5360.5 does not define “prearranged,” and they were reluctant to impose a minimum time requirement as some other jurisdictions have done. Instead, they were guided by the plain meaning of “prearranged” as something arranged in advance. Not Economic for Commuting - Car sharing is generally not cost-effective for commuting to a full-time job on a regular basis. Hourly fees accumulate whether or not the vehicle is in motion, making it expensive to pay for a vehicle as it sits idle at the workplace. Most carsharing advocates, operators and cooperating public agencies believe that those who do not drive daily or who drive less than 10,000 kilometers (about 6,200 miles) annually may find carsharing to be more cost-effective than car ownership. But variations of 50% on this figure are reported by operators and others depending on local context. Transaction Costs -While mobile information technology is lowering the barrier, there are opportunity costs of time spent finding an available car, booking a reservation, and traveling to a pod. Rental Excise Taxes - According a study from the Chaddick Institute for Metropolitan Development at DePaul University in Chicago. In many markets, including Miami, New York, Philadelphia, Pittsburgh, Seattle, and Tampa, one-hour carsharing reservations are taxed at well over twice the prevailing rate of sales tax. In seven of the 25 largest cities in the study‘s sample of 82 cities with carsharing services, taxes on one-hour reservations exceed 30%. Nationally, the average tax is 17.93% for one-hour carsharing reservations and 14.08% for 24-hour reservations. By comparison, sales taxes in cities with carsharing services average just 8.06%. Even major car rental companies agree when the excise tax is calculated per transaction, there are inequities in hourly reservations. With the $5 per transaction fee in New Jersey, the $8 rental becomes $13. Several major cities, including Boston, Chicago, and Portland Oregon, have created definitions for neighborhood carsharing organizations that are used to provide waivers from certain taxes. transportation. Consumers as a whole drive significantly less and use non-motorized transport (e.g., walking and biking) considerably more after joining a carsharing organization (CSO) without substantially reducing their use of public transit. The associated social and environmental benefits suggest that policies discouraging carsharing are detrimental to the public good. One the other hand, rental companies point out “Car sharing rentals are simply rentals of a shorter period of time.” What if car sharing was more aptly termed "hourly car rental" or "automated car rental?" Would legislators feel the same way about tax exemptions? are fundamentally different than those made available by traditional car-rental companies, highlighting some carsharing organizations' commitment to neighborhood improvement, entrepreneurial spirit, and civic-minded goals. Such definitions have loomed large in the battles over taxation in several cities. In 1999 Multnomah County, Oregon, an area encompassing most of metropolitan Portland, amended its municipal code to exempt carsharing from a 17% tax on motor vehicle rentals. A definition was created to determine eligibility while requiring ―commercial establishments‖ (rental car companies)to continue paying the tax. Competition from Traditional Car-rental Companies - Enterprise, Hertz and Avis, for example, all offer hourly rentals in selected cities, including at some airports. They could soon exert significant downward pricing pressure. These services, however, are distinct from membership-based carsharing organizations on account of the fact that insurance is not automatically included and customers typically must to go to rental-car lots to pick up and drop off vehicles as well as completepaperwork before obtaining keys (although virtual car rental is becoming more prevalent), making them less-than-ideally suited for the brief neighborhood trips. Carsharing remains small compared to the neighborhood car-rental business, which when measured by the number of vehicles available is more than 20 times its size. Profitability - The profitability of carsharing has yet to be demonstrated unequivocally in any sector of the industry. Zipcar has experienced a net loss every year since its inception in 2000 and warns potential investors that losses are likely to continue in the near term. Low Population Density Areas - Successful carsharing development has tended to be associated mainly with densely populated areas such as city centers and more recently university and other campuses. There are some programs (mostly in Europe) for providing services in lower density and rural areas. Low-density areas are considered more difficult to serve with car sharing because of the lack of alternative modes of transportation and the potentially larger distance that users must travel to reach the cars. Privacy - Previously, when you wanted to contact another user on Zimride, you would need to send them an email, and the conversation would take place from your email inbox. Now with the new messaging system you can contact other users without ever revealing your personal email address. Cool Factor - Broad attitudinal shifts appear to be reducing the perceived value and cultural significance of traveling by private automobile. Such shifts appear especially pronounced among millennials and other young people, a premise explored in a recent Zipcar study and our research at DePaul University. Both studies suggest that privately owned automobiles have lost much of their symbolic value among the young. GPS - Position tracking of users using GPS enabled devices to avoid the necessity to manually enter the current position when requesting/offering a ride. This also allows the use of fleet management systems for vehicle tracking and guiding, e.g. in case passenger pickup requires a short detour. Ideally, the navigation system integrates a ridesharing functionality. RF Technology - Car2go customers have a member card. In order to unlock the vehicle, simply hold up your member card to the reader on the windshield. The reader will indicate the doors are unlocked so that you can quickly get in. After you have gotten into the car, you will need to enter your personal code (PIN) into the touch screen, and also assess the cleanliness of the vehicle and confirm that it is not damaged. Once you complete those questions, you will be prompted to access the ignition key. The ignition key is located to the right of the touchscreen. Remove it and insert into the ignition located next to the gearshift. Then, the car2go is started as you would a normal vehicle. Development Policies - In Philadelphia‘s Central Delaware Riverfront Overlay District, developers can substitute one carsharing stall for four required parking spaces for up to 40% of total required spaces devoted to residential and hotel uses (Philadelphia Code). For developments in Seattle requiring 20 parking spaces or more, each space set aside for a carsharing vehicle reduces the required minimum by three spaces, or 15%, whichever is less (Seattle Municipal Code). Buzzcar - France - P2P Car Share launched March 2011. Focused on France and was started by Robin Chase, the co-founder of car sharing 1.0 leader Zipcar. Car2go - Allows users to take and leave vehicles at any point within the city limits. You can start rentals anywhere inside the operating area wherever there's a car available, and end wherever there is qualified parking available. Normally, within the urban area, the nearest Austin car2go is never further away than a 5 minute walk. Only during periods of extreme utilization could the distance sometimes be somewhat greater. Started in Ulm, Germany and available in Vancouver, Canada and Austin, Texas. CityCarshare: San Francisco Bay Area, CA - A nonprofit organization in its 10th year with a social responsibility to emphasize the lowering of congestion, reduce of greenhouse gas emissions and to make mobility cheaper. It’s the longest-running car-sharing nonprofit in North America and it helps the Bay Area save about 20 million miles of travel on Bay Area roads each year. It encourages people to walk, bike or take the bus, but is available if you absolutely need a car. CityzenCar - France - P2P Car Share launched January 2011. Focused on France and uses automated locking by a network of approved installers, creating a network of founder/car owners. Getaround.com San Francisco - A new peer-to-peer car-sharing service currently available in . Getaround does not offer transportation services. Instead, the service allows renters and owners to transact rentals directly with each other. Investors include $3.4M, CrunchFund, Redpoint Ventures, General Catalyst + angels. Getaround’s August 2012 $13.9 million Series A round was led by Menlo Ventures, with managing director Shervin Pishevar joining the company’s board. Other investors include new Yahoo CEO Marissa Mayer, A-Grade Investments, and Eric Schmidt’s Innovation Endeavors, as well as Collaborative Fund, SOSventures’ Sean O’Sullivan, Correlation Ventures, HotelTonight CEO Sam Shank, Yammer CEO David Sacks, Saba Software CEO Bobby Yazdani, Hoteles.com founder Matias de Tezanos, Clarity.fm founder Dan Martell, and .CO CEO Juan Diego Calle. IGo Carshare - Chicago Metro Area - In 2005 Chicago, Illinois amended its municipal code to eliminate the city‘s 8% Personal Property Lease Transaction Tax for carsharing reservations less than 24 hours in duration. (Carsharing reservations of 24 hours or more are still subject to the tax.) The city defined a carsharing organization as one that is membership-based, provides access through a self-service reservation system with no written agreement required at each reservation, utilizes an environmentally friendly fleet, and has the required insurance. Livop focuses on car sharing in France and uses key exchange. RelayRides, San Francisco - A P2P service, borrow cars from car owners in your neighborhood, by the hour or by the day. For those borrowing a car, rates start at just $5 per hour, or $55 for daylong reservations. There are no late fees--you just pay for the time you used the vehicle--and gas is included in the reservation (with every 20 miles being complimentary). RelayRides offers a $1,000,000 insurance policy plus 24/7 roadside assistance. The company says it costs, on average, $715 per month to be a car owner. Average per month spending for RelayRides users is only $100. Though car sharers can set any rate they want, they lose 35 percent immediately: 15 percent goes to the pockets of RelayRides and 20 percent goes to the company’s $1 million insurance policy. The sharer also loses out on gas money, though RelayRides says the average driver only travels 5.8 miles in an hour. RelayRides requires a device installed in the owner’s car. The device allows the car owner to unlock doors, immobilize the engine, find the car (via GPS) and track mileage. It also allows owners to disengage their car remotely if their car should become compromised--a critical security feature for this kind of service. In August 2011, Relayrides announced that it has increased its total Series A.2 funding to $10 million, with the help of Shasta Ventures and entrepreneur/environmentalist Lisa Gansky. Original backers in the Series A include Google Ventures and August Capital. Relay Rides no longer installs its own in-car connected systems in the vehicles in its network. The company’s original model was to have its staff install the connected devices in the vehicles, which took money and time. Now Relay Rides is relying on its partnership with GM, and Onstar, to supply the vehicle connectivity and control system. RelayRides also experimented with whether or not it should offer gas cards, and how to cover the cost of gas for very short trips. It’s not necessarily obvious how to set up a system like this, as the only precursor is traditional car sharing like Zipcar, where the company owns the cars and is responsible for their upkeep and gas bills. Rent2Buy is the car-sharing service started by Automoti founder Moti Kahana and e-commerce executive Todd Daum, formerly of Overture, Yahoo and TrueCar. Automoti, an online rent-to-buy service was later acquired by Hertz in 2009. Currently, Rent2Buy’s advisors include current and past executives from top rent-a-car companies, including National, Hertz, Budget and Alamo. Unlike HiGear, which had previously specialized in the temporary rentals of luxury vehicles by clients, Rent2Buy, as the name implies, also facilitates the purchase of the cars in its inventory. Car owners, both individuals and dealers, are able to generate rental income on vehicles while waiting to sell. Meanwhile, renters have the opportunity to get to know the cars they’re interested in purchasing by driving them for extended periods of time. With the acquisition of HiGear, Rent2Buy will be able to provide additional access to consumers and inventory in the San Francisco and Los Angeles markets. Daum tells us that Rent2Buy purchased both the HiGear sharing platform as well as the sharing inventory and customer database. The news follows the company’s decision to shut down operations last month, after a criminal ring targeted HiGear, resulting in multiple incidents of theft involving its members’ cars. The criminals stole four cars totaling $400,000 by using stolen identities to bypass HiGear’s background checks. Rent2Buy had been bound by a non-compete with Hertz since the sale of Automoti in 2009, and have only recently been able to re-focus on the rent-to-buy space. RentMyCar is the oldest site out there but basically only acts as a middleman. No insurance, no automated locking system, no community element. Spride Share - another P2P provider serving the Bay Area, launched its piloting phase in October 2010 following the passage of a new state law permitting this method of carsharing. Spride is partnering with City Carshare, a traditional carsharing organization, to pool membership and vehicle networks. Spride has an impressive advisory board, and the company was instrumental in getting insurance legislation passed in California. WeCar - St. Louis - Enterprise Rent-A-Car became the first to launch a domestic carsharing service when it established WeCar in early 2008. WeCar now serves 14 states and emphasizes partnerships with universities, corporations, and governments. In August 2011, Philly Carshare took the unprecedented step of selling itself to car rental giant Enterprise - ending a significant chapter in the early history of carsharing in North America. Exactly what it portends for the future is hard to say right now. Philly Carshare was reportedly under the gun to pay $2.7 million in car rental taxes it had not charged members for during the past several years. It was reportedly having trouble paying creditors, as well. Reports say that Enterprise is expected to retain the Philly Carshare name and employees. The press announcement also says it will operate the service independently of their car rental operations and makes no mention of the company's own WeCar carsharing brand. Here's the official press release(PDF). Wheelz has a plan to focus on college campuses and launched at Stanford. Zimride , Palo Alto, CA - Offers an application on Facebook Platform, inviting users on the same network to meet each other and share a car trip. Users can also visit the service on its website at Zimride.com and find trusted users through Facebook Connect. After entering their current location and their destination, Zimride will generate a list of potential matches arranged by how far out of the way each one wants to travel. Users can also post a destination they’d like to travel to some time down the line, and receive alerts through Email when a match pops up. The service is offered for free for up to 50 members per school or company network, but once it crosses that threshold Zimride seeks out the network owner and asks them to pay a subscription fee if it wants to continue allowing its students or employees to use the service. The company works with transporation departments and student governments at universities and large companies, and charges universities $9500 a year for the service (they can pay month-to-month). As of 2009, the company has managed to sign up 20 instutitions, including Stanford which has seen over 14,00 new users share 300 rides in three weeks. And aside from earning money as a carpooling company (which is impressive in itself), Zimride is also notable for being a Facebook application that generates revenue through something other than advertising. Zipcar, Cambridge, Mass - (NasdaqGS: ZIP ) - By far the largest for-profit provider and now offers its services in 11 major metropolitan areas and on over 230 college campuses. Zipcar issued its first publically traded stock in April 2011 and now serves more than thirty states as well as Canada and the United Kingdom. As of December 2010, the company offers a fleet of over 8,000 vehicles and has over 560,000 members which the company refers to as "Zipsters". Zipcar offers more than 30 makes and models of self-service vehicles by the hour or day. Zipcar has major operations in Atlanta, Baltimore, Boston, Chicago, London, New York, Philadelphia, Pittsburgh, Portland, San Francisco, Seattle, Toronto, Washington D.C. and Vancouver. In the fall of 2007, Zipcar merged with Seattle-based rival Flexcar to create a car-sharing company with national scope. In December 2009, Zipcar announced their participation in a round of financing with Avancar, the largest car sharing company in Spain, based in Barcelona. Under the terms of the agreement, Zipcar acquired a minority interest in Avancar, a Zipcar executive joined Avancar's board and Zipcar was given a year option to increase the company's ownership stake. In April 2010, Zipcar announced that it had acquired London-based car-sharing club Streetcar. This brought the number of Zipcar members to over 400,000. The World Carshare Consortium - An informal shared public interest knowledge building network serving carshare operators worldwide, potential start-ups, policy makers, local government partners, researchers, public interest groups, cooperating transporters, concerned citizens, and others interested both to learn more about carsharing and how it works , as well as latest developments in the field internationally. Car Sharing Research - Innovative Mobility Research - IMR designs research projects and conducts evaluations throughout California, the U.S., and internationally. It is based at the Transportation Sustainability Research Center (TSRC) at the University of California, Berkeley. http://carsharingus.blogspot.com/ - Personal blog of Dave Brook, the founder of CarSharing Portland, the first commercial car-sharing service in the United States, started in March 1998. Car Sharing Association - CSA represents carsharing organizations (CSOs) interested in improving the credibility, quality of service and public knowledge of the carsharing industry.